Robert Bailey, a retired government employee, said he wants to "take care of it for the next generation in my family." A New York man who won the state's largest-ever lottery jackpot said he wants "to do the right thing and take care of it for the next generation in my family." 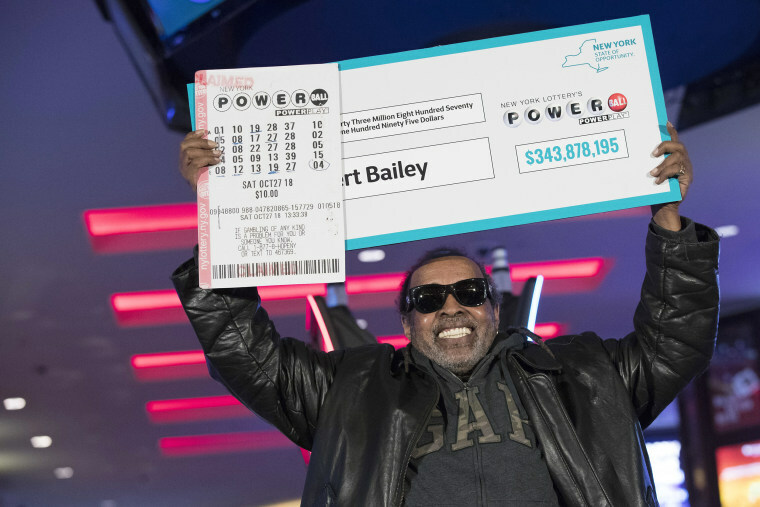 Robert Bailey, a 67-year-old retired government employee who lives in Manhattan, chose to take a lump sum payment of his $343.8 million in winnings, which comes to more than $125.3 million after taxes. Bailey, who won in the Oct. 27 drawing, said at a press conference Wednesday that he has already consulted with a lawyer and financial adviser about his sudden windfall. "I still want to be me; I can’t let money change me. But I want to do the right thing and take care of it for the next generation in my family," Bailey said. "That’s why I went to a lawyer and a financial adviser first and sat down with them and talked business." Bailey remained mostly tight-lipped about his plans, except to say he hopes to buy a house for his mother, travel and “make good investments." There are a few cautionary tales of lottery winners who went broke after blowing through their earnings. For example, Willie Seeley, who with his coworkers won $450 million in 2013, told NBC News in 2015 that the "drama is nonstop" after winning. Seeley took home $4 million personally. He and his wife quit their jobs, bought new cars, helped out family and ran through the money quickly. "The biggest mistake I see is people who try to do this on their own right from the get-go," said Jason Kurland, an East Meadow, New York, attorney who has had lottery winners as clients, told NBC News in October. "Those are the ones who put themselves out in the open, who can't limit their exposure, and are now an easy target for people, whether it's a bogus charity coming to you or someone with an investment that's a [supposed] no-lose situation." Bailey declined to answer questions about his family except to say that he was single with a few children. When asked if there are charities he plans to donate to, he said he has "a few" in mind, but would not make any decisions without consulting with an adviser. He also said he wished he could remain anonymous, but New York State law prevents anyone from collecting lottery winnings privately. "But you have to watch out for your safety, that’s the main thing," Bailey said. "With any type of money, and this type of money also."